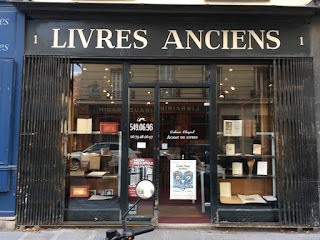 Or, in this case, two: on the far side of the street, you can see a store selling "livres anciens" -- "old books" and on this side a "librairie". But don't think that means it's a library. 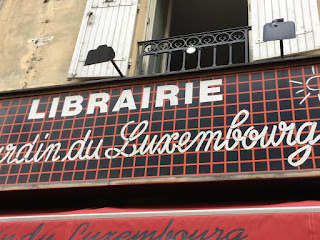 "Librairie" is the French word for book store (and "bibliothèque" is the French word for library). It takes me all of three minutes, on a random walk home, to find my first books stores, these two on corner directly opposite. 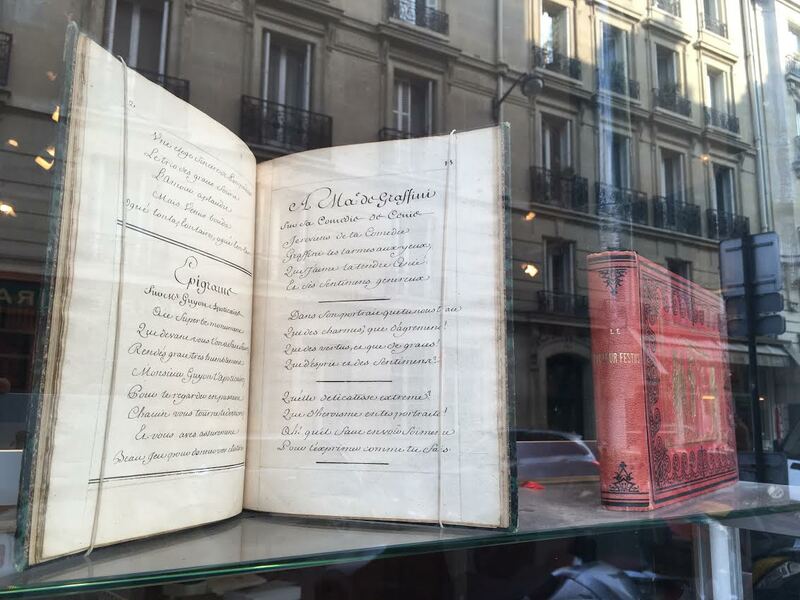 The windows are filled with not just the obvious best sellers; there are poems, political works, plenty of history. According to one recent study I found, Paris is in the top ten cities world-wide for bookstores per capita: #9 on the list with nine bookstores for every 100,000 people. And #4 on the list with just over 9 libraries per 100,000 people. It's the kind of place where streets are named for authors. It's the kind of place where statues are erected to poets, in this case 16th century poet Pierre Ronsard. 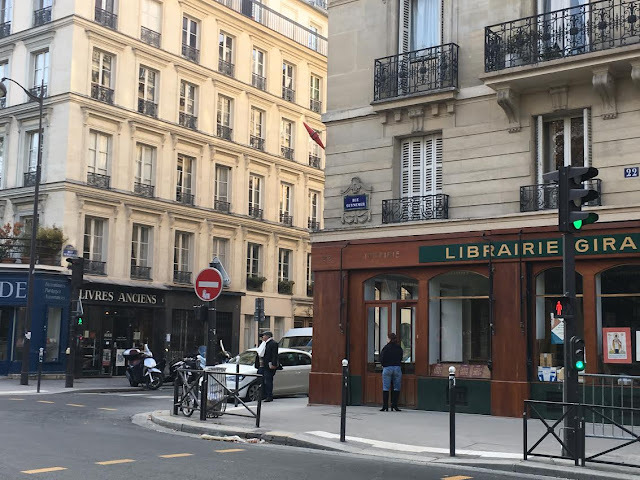 In the 6th arrondissement, an entire wall honors poet Arthur Rimbaud and his 1871 poem, "Le Bateau Ivre" ("The Drunken Boat") seeing as how he first recited this poem nearby. And, of course, there are the famous bouquinistes (book-sellers) who line the Seine with their green boxes, open especially on nice days, but sometimes in the gray and gloom also. It's the kind of place where even the graffiti can be literary: The famous phrase "Je pense, donc je suis" ("I think, therefore I am") is altered here on an ATM cash machine to "Je dépense, donc je suis" ("I withdraw, therefore I am"). It's a perfect pun in French. It's the kind of place where a homeless encampment has as many books as clothes. This is not just a Paris thing. 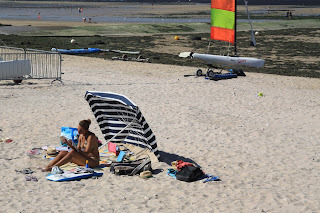 This past summer in Normandie, we come across a take-one-leave-one free book exchange by the beach. And later in the day by a parking lot. 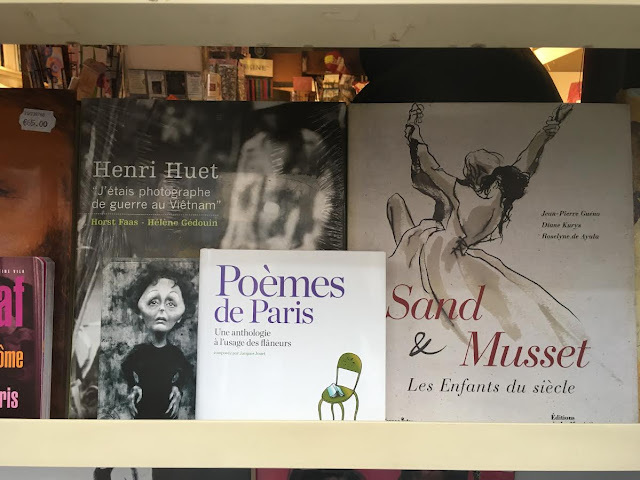 You can buy a crepe, and a book to go with it, at "Aux Bains des Mots" ("The Word Bath" -- a pun on so many levels: you are near the ocean, which explains the "bath" part. But also it's in the town of Aubin, which is pronounced exactly like "aux bains"). 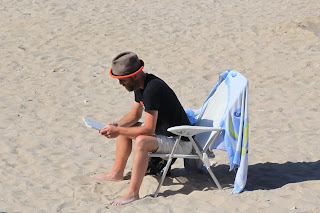 On the beach itself, people read. From actual paper. But, you're saying, people read on beaches everywhere. Ok, then, how about the subway or bus? It's still as common here to see somebody with a book as with a cell phone. Sure that will change, and probably soon. But for the moment, it's rather quaint. At Chantilly castle, we're gobsmacked by the library (that's library, not librairie), in which the 19th century owner, the Duke d'Aumale collected 60,000 volumes, most of them antique and valuable even at the time. About 15,000 are on display, locked behind cabinets to be sure, and I can't even guess how much they're all worth. 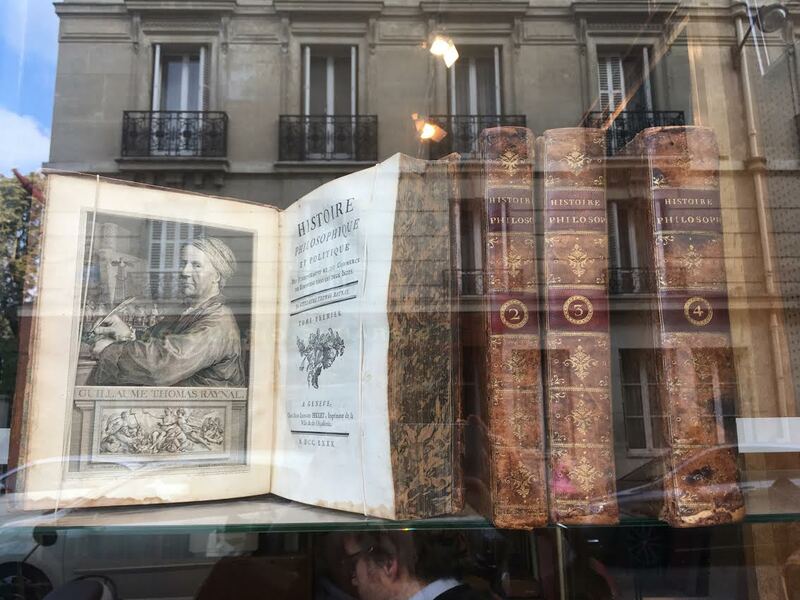 Indeed, antique books are still sold, commonly, from charming little book shops. I can never figure out how these musty-old book-sellers are doing enough business to pay the rent and the salaries. But they do it. 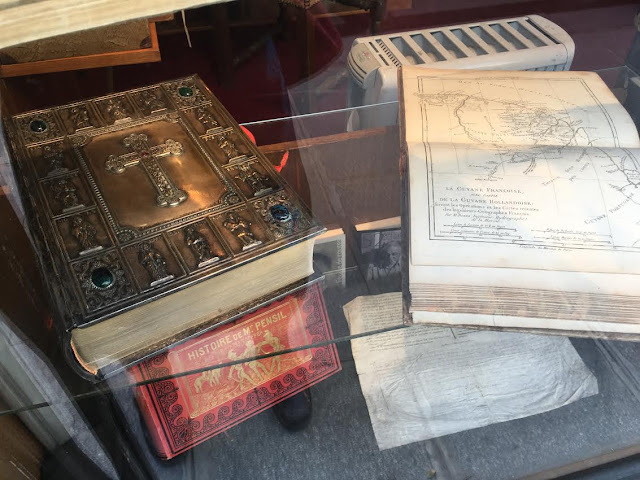 I guess there's more of a market for hand-calligraphied folios and old bibles than I can imagine. 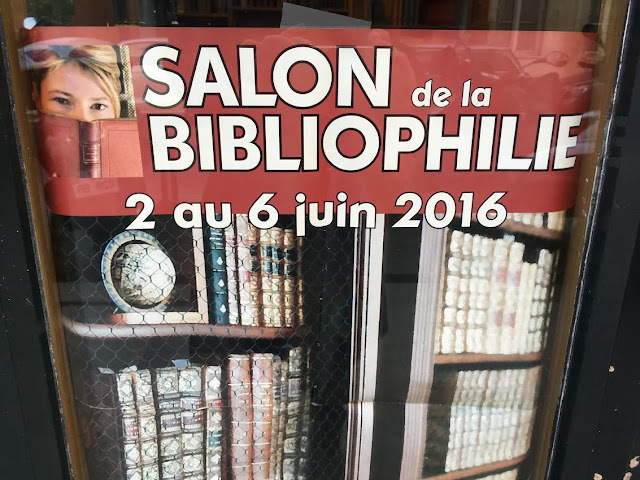 Bibliophiles have a field day in France. "Biblio" the root meaning "books" is of course where the French get their word for library, "bibliothèque". 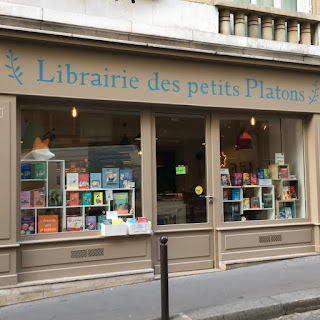 And another variant of that root, "livres" is the word that means "books" in French and from which they get their word "librairie" or bookstores. As book-buyers and book-lovers know, it's an addiction, whether you're the kind of person who buys expensive antiques or used copies of children's books or current best-sellers, or books on themes like France. Or cheese. So many good books! I love them all...until we have to pack them up and ship them back to the US, that is. Bouca is a raw goats' milk, farmhouse cheese from Poitou-Charentes, or as the larger region that encompasses it is actually now called, Nouvelle-Aquitaine. The name says it all, if you know that the root word "bouc" means goat in the old local dialect. Bouca is a creamy, semi-soft cheese that is aged for a minimum of two weeks. Judging from the crust, and the taste, I'd say it's usually a lot longer than that, at least for the fuzzy, gray-green-white mold version I taste. It's a lovely cheese -- thirst-inducing but classic: salty, buttery, and with the flavor of the farm and the fields melting in the mouth. 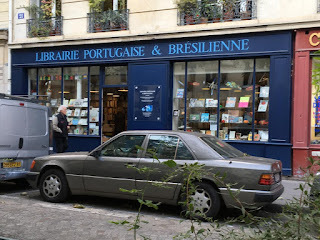 I know it's a cheesy connection, and I mean that in the figurative sense that it's not the most intellectually formidable connection, for one of the more intellectually formidable aspects of France -- its love of books. I know it's feeble. You know it's feeble. I know you know it's feeble, and now you know I know you know it's feeble. But here it is, anyway, because after 600 cheeses and story combinations, it's not always easy to come up with the perfect pair: The cheese's name is pronounced roughly "book-a". 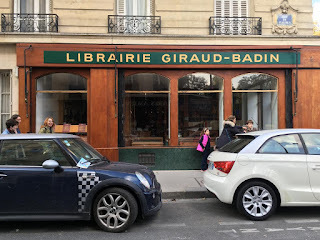 Oh, I thought the connection was in the slang word "bouquin", which means "book" in French ! 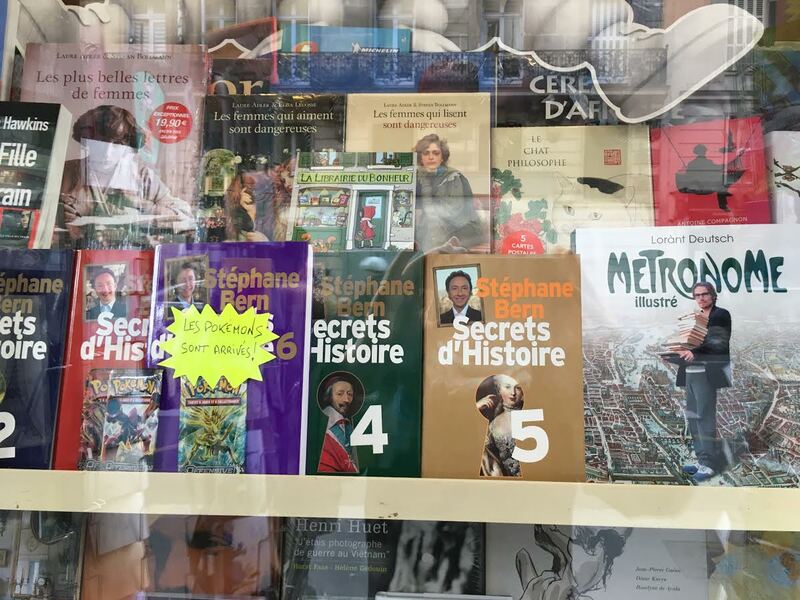 I love that the French protect the (book) publishing industry. Is "La Hune" still there, I wonder?